Exceed And Excel needs no introduction to racing enthusiasts as a Sire that “pound for pound” can be easily argued as the “best value” sire in Australia. His deeds as a Sire are simply phenomenal. He is the Sire of 156 Stakes Winners with earnings over $171 million. With 12 Crops of Racing Age he has just set a New “PERSONAL BEST” when it comes to his Sales Results in the auction ring, as one of his son’s Sold for $1.7 million and a daughter for $1.2 million at the 2019 Inglis Australian Easter Yearling Sales. The demand for EXCEED AND EXCEL has simply Skyrocketed since January on the back of yet another wonderful 2YO Season he is having. Owners want success and to achieve it, there is a proven formula that optimises that opportunity – Buy the Best available progeny - by the Best Sires - from the Best Race Fillies and Mares – from the Best Pedigrees (both genetically and commercially) and be assured that the yearling does pass a full veterinary inspection including x-rays, endoscope and blood testing. Then ensure you buy them at the right price and not be swept up in emotional hype of bidding war in the auction ring. His Son MICROPHONE claimed Gr1 success winning the Sires Produce. He also achieved Gr2 Success winning the Skyline Stakes and then Listed success winning the Talindert Stakes. He also finished runner-up in the Gr1 Golden Slipper to (Exceed And Excel’s own grand-daughter) KIAMICHI and runner-up in the Blue Diamond Preview (C&G) LR. BIVOUAC is another Exceed And Excel 2YO Stakes Winning colt. He has won 2 stakes races this season being the Gr3 Kindergarten Stakes and the Lonhro Plate LR. McLAREN is a third stakes winning 2YO Colt. He won the Gr3 Canonbury Stakes and ran 3rd in the Black Opal Gr3. However it’s not just the 2yo’s that have been flying the flag for EXCEED AND EXCEL this season. So far this season Exceed And Excel has recorded 9 Stakes Winners including two (2) Gr1 Winners. His other Gr1 Winner is MR STUNNING. The 6yo gelding claimed the Longines Hong Kong Sprint Gr1 and was runner-up in the Centenary Sprint Cup Gr1 as well as being a further second and twice third in Gr2 races. 3yo colt DANAWI won the Gr3 Ming Dnyasty and was runner-up in the Up and Coming Stakes Gr3. 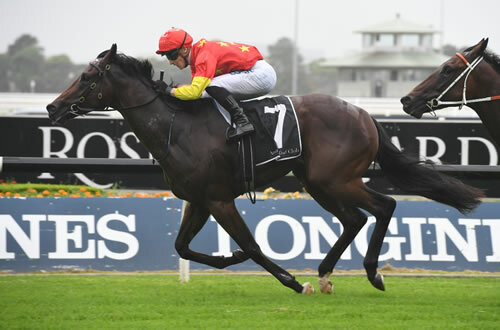 8yo evergreen gelding THERMAL CURRENT won the Listed Absolut Stakes and was runner-up in the Listed Bob Hoysted Stakes and third in the Gr2 Rubiton Stakes. This stakes success by Exceed And Excel is not limited to the boys. The girls have had a good run as well. RESIN (4yo mare) won the Gr3 Nivison Stakes and ran second in the Birthday Card Gr3 and third in the Wenona Girl Gr3. MANICURE (4yo mare) won the Nudgee Stakes LR and has finished runner-up in the Triscay Stakes Gr3 and third in the Guy Walter Gr2. FIERA VISTA also a 3yo filly won the Morphettville Guineas. Exceed And Excel has also sired another 7 Stakes Placed runners including the 2yo’s Chicago Bulls and Mayaaseh along with Performer, First Among Equals, True Excelsior, Isaurian and Major Wager. EXCEED AND EXCEL achieved a new high sales ring figure during the sale. Previously EXCEED AND EXCEL had twice achieved a sales ring high of $1.2 million with a total of 4 yearlings having achieved $1 million or higher. It started with Lot 137 - a Filly from the Gr2 Winning mare MORE THAN REAL (USA) that was knocked down for $1.2 million. That equalled his previous high prices set in 2007 and matched in 2017. Then on Day 2 that figure was smashed when Lot 337 a Colt from the Gr3 Winning mare WRITTEN DASH was knocked down for $1.7 million. $1.7 million; $1.2 million (3); $1 million (2); $900,000; $800,000 (5). DYNAMIC SYNDICATIONS purchased 2 fantastic COLTS by EXCEED AND EXCEL in January at the Magic Millions Sales and we are delighted with that decision. Had either of those colts been offered at this Inglis Easter Sale there would be no way we would have been able to afford them. Both our colts are spectacular types from high-class Stakes Winning mares. As a result there is no way our Dynamic Syndications Owners would be able to access the progeny of one of the hottest sires in the Southern Hemisphere. We have achieved Gr1 Success with EXCEED AND EXCEL through his son REWARD FOR EFFORT who won the Blue Diamond for us. Both our colts have been purchased to aim at the big 2YO races. Importantly we have chosen to offer one of these colts in a “LADIES ONLY” Ownership Syndicate with Gai Waterhouse to aim at the rich Magic Millions Women’s bonus. By EXCEED AND EXCEL from EVERAGE – 5% Shares $8,750 inc GST & ALL COSTS to 30/6/19. EVERAGE won 3 races as a 2yo including the ATC Keith Mackay Stakes LR and she was Gr3 placed in the ATC Kindergarten Stakes and Listed placed in the ATC Widden Stakes. Our colt’s 1st Dam, 2nd Dam, 3rd Dam and 4th Dam were all 2YO Stakes Performed Racehorses. Each of these 4 Dams were by Sires who were Champion 2yo’s of their own generations. The Other COLT we purchased we gave to CIARON MAHER & DAVID EUSTACE to train. TIMBOURINA (by Timber Country) was one of the Highest Quality racemares of her generation. She was a Gr2 Winner and was Gr1 Performed 4 occasions. Overall she earned Black-Type on 8 occasions. TIMBOURINA won 4 races (3 in succession) including the VRC Wakeful Stakes Gr2. She was runner-up in the STC Canterbury Guineas Gr1, also the VRC Let’s Elope Stakes Gr3, and the Illawarra Turf Club Keith Nolen Classic LR. She was placed 3rd in the VRC Oaks Gr1, and was 4th in the AJC Australian Derby Gr1, along with the STC Arrowfield Stud Stakes Gr1 and AJC Kindergarten Stakes Gr3. TIMBOURINA is a half-sister to MEDIA a Gr2-Gr3-LR Winner. TIMBOURINA is a half-sister to CARDINAL VIRTUE a LR Winner & Gr1 placed. TIMBOURINA’s Dam is VALOURINA (by Snippets). She was a dual Stakes Winner and won a total of 7 races including the VATC HDF Mc Neill Stakes LR and the MVRC William Crockett Stakes LR. It simply isn’t possible to buy better. Whilst you may be able to source a pedigree close to being equivalent - you can’t find a pedigree that is better! We inspected the Written Dash Colt at the sales – he too, was a nice colt the same as our colts are. The TIMBOURINA pedigree is significantly stronger than the pedigree of the Written Dash colt that sold for $1.7 million. WRITTEN DASH (by Written Tycoon) was a Gr3 Winner and only stakes performed in one race. The pedigree of EVERAGE is near identical to that of Written Dash. However Everage was a better performed racehorse. The WRITTEN DASH sold for 11.3 times the value of our TIMBOURINA Colt, and 18.9 times the value of our EVERAGE Colt. So it certainly supports what fantastic buys our two (2) EXCEED AND EXCEL Colts have been. With 80% now Sold in both our Exceed And Excel Colts - don’t delay having a chat to ADAM WATT at Dynamic Syndications on 02 9540 1511 or 0409 464 378 to find out more.